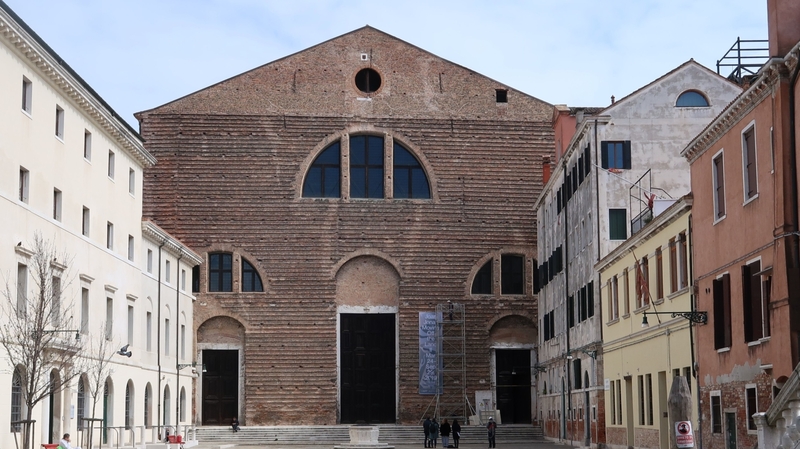 Ocean Space reintegrates the historic Church of San Lorenzo back into the cultural fabric of Venice, after two years of conservation and renewal and more than 100 years of being largely closed to the public. For many, the opening of Ocean Space is the first moment in living memory when it is possible to experience this magnificent and enigmatic architectural structure. Fabled as the final resting ground for Marco Polo, the Church of San Lorenzo dates back to the ninth century. Recognizable by its rough, unfinished façade, the current structure was built in the late sixteenth century (1592–1602) according to designs by architect Simone Sorella. Inside, a three-bay screen and a rare and resplendent, two-sided altar—designed in 1620 by Girolamo Campagna—bifurcate the massive interior volume. Over the centuries, San Lorenzo was known as a center for music, where celebrated seventeenth-century composer Antonio Vivaldi, who was born in Venice, performed and rehearsed. The church suffered damages during the Napoleonic War and, in 1810, was deconsecrated and all decorations except the main altar were removed. It closed to the public in 1865 and, in the early twentieth century, underwent a series of archeological excavations, in search of the remains of Marco Polo. San Lorenzo has been the site for temporary installations over the past few decades, most notably Renzo Piano’s architectural intervention for the presentation of Luigi Nono’s opera “Prometheus,” as part of the international music festival at Biennale di Venezia in 1984, and a sonic intervention by artist Ariel Guzik for the 2012 Mexican Pavilion of the Biennale. Since 2016, TBA21–Academy has been working to return the structure to the community for sustained active use. Key revitalization work, overseen by restoration expert Gionata Rizzi together with engineer Franco Pianon, has included the major stabilization and consolidation of the edifice, a complete replacement of the ceiling, and a backfilling of the floor—in such a way as to protect the previous archeological excavations. Starting in fall 2019, Ocean Space will undergo additional work on its interior to support its transformation into a dynamic transdisciplinary hub for oceanic research and innovation, designed by architect Andrés Jaque from the Office for Political Innovation. Ocean Space’s program will relaunch in spring 2020, with work on its interior design expected to be completed over the next two years.